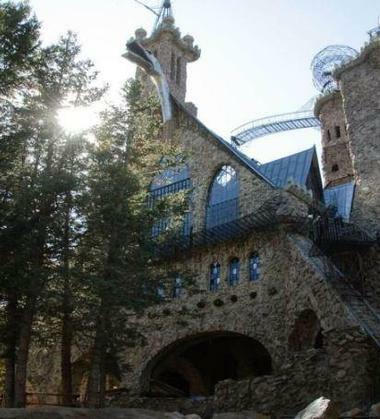 Located in Central Colorado, Bishop Castle has quickly become one of the most popular roadside attractions in the state. In 1959, fifteen-year-old Jim Bishop dropped out of school and purchased a 2.5 acre piece of land for $450. 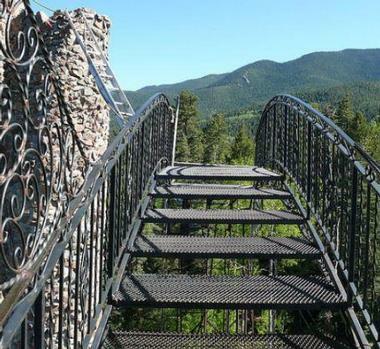 This piece of land was located alongside southern Colorado’s San Isabel National Forest. In order to earn enough money to purchase the land, Bishop worked random side jobs and helped his father, Willard. Although Bishop funded the land purchase, his parent’s legally owned the land since Bishop was only a teenager. During the next teen years, Bishop and Willard regularly camped on the land and began planning a design for a family cabin. In 1967, Bishop married Phoebe and began building a cabin for them in 1969. One of the most prevalent natural materials in the area was rocks, so Bishop decided to craft a stone cottage. From 1969 until 1971, Bishop and Willard alternated working on the cabin and running the family business. In the spring of 1971, Bishop and Willard decided to use a large metal tank to supply the cabin with water. Since the metal cylinder was 40 feet tall, Bishop and Willard continued to build the walls of what was originally a small cabin. 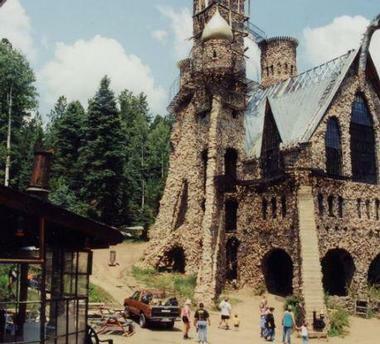 Friends and neighbors of the cabin would consistently joke with Bishop and Willard that they were building a castle. 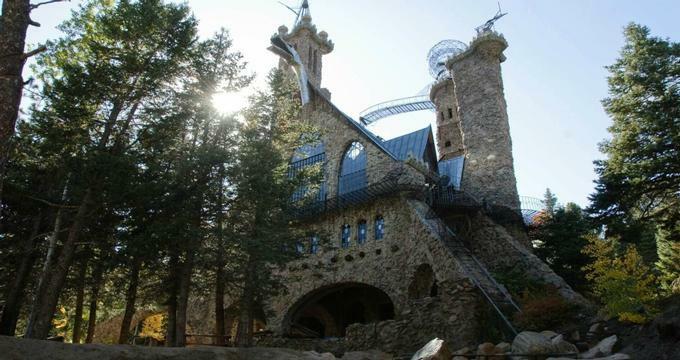 Eventually, Bishop decided to turn his original plans of a small cabin to a large castle. The castle continued to grow and eventually become known as the Bishop Castle. As the Castle grew larger, it gained popularity. Throughout the years, volunteers would verbally agree to help Bishop build the castle, but they would never show up. Eventually, Bishop stopped seeking out volunteer builders and decided to finish the castle by himself. The Bishop Castle is known as the country’s largest castle that was built by one man. · Three stories full of interior rooms, such as a grand ballroom. Admission into the Bishop Castle is completely free. It’s important to note that people live and work in the Bishop Castle, so be mindful of that while exploring the Castle. Also, the Bishop Castle is continuously expanding by Mr. Bishop’s own dedication and construction. So, you should proceed with a little bit of caution while touring the castle. If you want to see Mr. Bishop in action, stop by the Bishop Castle during a weekend. Since Mr. Bishop wanted to make Castle experiences as personal and explorative as possible, there are no guided tours. Instead, visitors are free to explore every nook and cranny of the Bishop Castle at their own desire. Although the Bishop Castle does not offer guided tours, large groups are encouraged to visit and explore the Castle. If a school visits the Bishop Castle for a field trip, they are welcome to listen to an inspirational presentation from Mr. Bishop himself. Although there is no fee for Mr. Bishop’s presentation, schools are encouraged to make a donation. The Bishop Castle regularly hosts private special events throughout the year. Schools are welcome to use the Castle’s facilities for educational purposes. Also, people are welcome to use the Bishop Castle as the location for their wedding ceremony. Although wedding ceremonies can be held at the Castle, people are not allowed to hold receptions or any other party similar to a reception at the Bishop Castle. · Restriction of closing off a specific area of the castle during the ceremony. · Reserve a date and time a minimum of two weeks in advance. · Hire a security service that is approved by the Bishop Castle’s employees. It’s also imported to note that the Bishop Castle does not have any heat or facilities for people to change. Also, there are no services or assistance provided by the Bishop Castle to provide guests with access to the Castle. 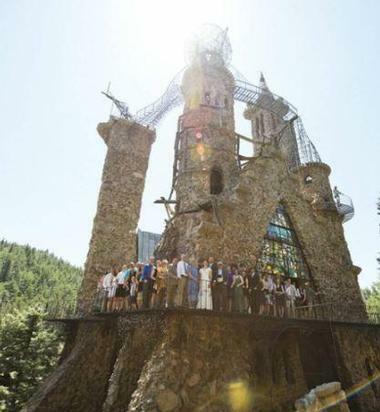 Lastly, while the Bishop Castle does not charge a fee for wedding ceremonies or any other private events, hosts are encouraged to make a donation to the castle of approximately $350.